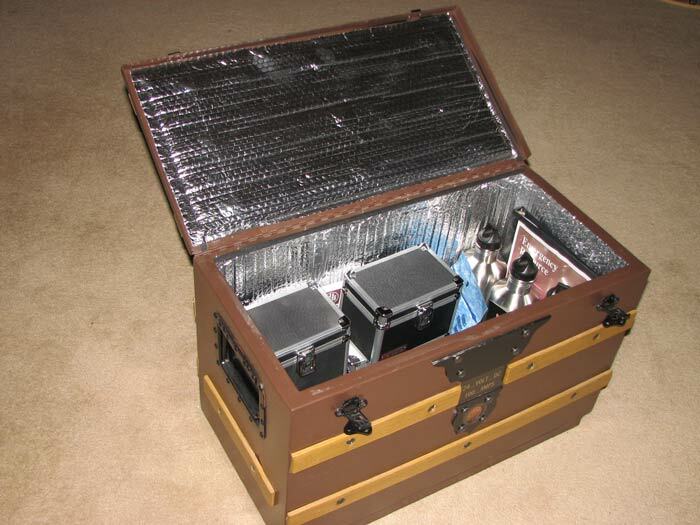 I bought a metal trunk at a government surplus warehouse and converted it into an emergency evacuation box. It’s about the size of a camping cooler and was used as a military flight-line battery box. It was pretty grubby looking and had a couple of 12 gauge extension cords and a small electric vacuum pump inside, all in working condition. The total price was $20, so it was a good deal for sure. 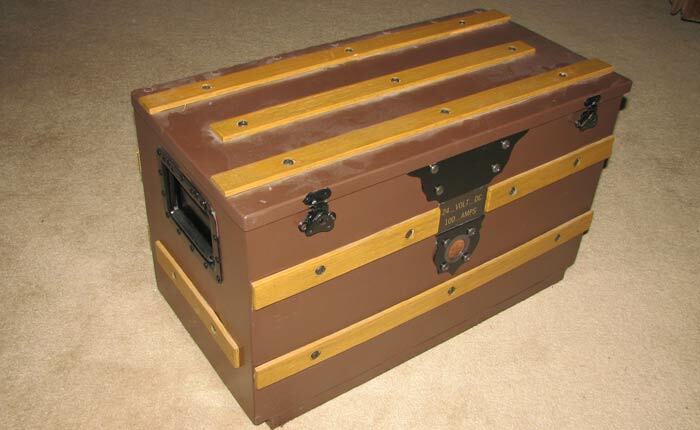 After I cleaned it up, I decided to make it look sort of like a retro-esque baby steamer trunk. I painted over the military drab with a brown spray paint that I had left over from another project. I bolted on the golden oak strips, both for the look and to keep it from bending if someone ever sat on it. I painted the handles and latches black for a bit of contrast and to use up some black spray paint I had. I lined the inside with reflective heater vent insulation, just ‘cuz it just seemed like a good idea. I added the decorative center piece to give it that steamer-trunk look, working it around the original electrical plaque. 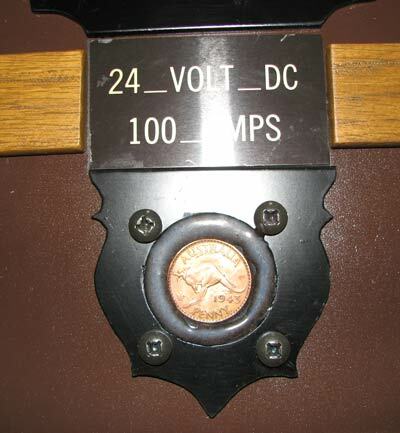 If you can make out the copper “button” through the glare of the shot, you see a 1943 Australian kangaroo penny. We’ve only had to evac once, but that was when a road construction crew (lowest bidder) ripped the gas main out of the earth. Basic emergency prep advice is for families to have such a “kit” to sustain them for three days in the event of an event. I have a big duffle in the car at all times for the same reason. A camping cooler would work as well of course, but this was more fun.